The Francis turbine is a type of water turbine that was developed by James B. Francis in Lowell, Massachusetts. It is an inward-flow reaction turbine that combines radial and axial flow concepts. Francis turbines are the most common water turbine in use today. They operate in a water head from 40 to 600 m (130 to 2,000 ft) and are primarily used for electrical power production. The electric generators that most often use this type of turbine have a power output that generally ranges from just a few kilowatts up to 800 MW, though mini-hydro installations may be lower. Penstock (input pipes) diameters are between 3 and 33 ft (0.91 and 10 m). The speed range of the turbine is from 75 to 1000 rpm. A wicket gate around the outside of the turbine's rotating runner controls the rate of water flow through the turbine for different power production rates. Francis turbines are almost always mounted with the shaft vertical so as to isolate water from the generator. This also facilitates installation and maintenance. Water wheels of different types have been used for more than 1,000 years to power mills of all types, but they were relatively inefficient. Nineteenth-century efficiency improvements of water turbines allowed them to replace nearly all water wheel applications and compete with steam engines wherever water power was available. After electric generators were developed in the late 1800s turbines were a natural source of generator power where potential hydro-power sources existed. In 1826 Benoit Fourneyron developed a high efficiency (80%) outward-flow water turbine. Water was directed tangentially through the turbine runner, causing it to spin. Jean-Victor Poncelet designed an inward-flow turbine in about 1820 that used the same principles. S. B. Howd obtained a US patent in 1838 for a similar design. In 1848 James B. Francis, while working as head engineer of the Locks and Canals company in the water wheel-powered textile factory city of Lowell, Massachusetts, improved on these designs to create more efficient turbines. He applied scientific principles and testing methods to produce a very efficient turbine design. More importantly, his mathematical and graphical calculation methods improved turbine design and engineering. His analytical methods allowed confident design of high efficiency turbines to precisely match a site's water flow and pressure (water head). Spiral casing: The spiral casing around the runner of the turbine is known as the volute casing or scroll case. Throughout its length, it has numerous openings at regular intervals to allow the working fluid to impinge on the blades of the runner. These openings convert the pressure energy of the fluid into momentum energy just before the fluid impinges on the blades. This maintains a constant velocity despite the fact that numerous openings have been provided for the fluid to enter the blades, as the cross-sectional area of this casing decreases uniformly along the circumference. Guide and stay vanes: The primary function of the guide and stay vanes is to convert the pressure energy of the fluid into the momentum energy. It also serves to direct the flow at design angles to the runner blades. Runner blades: Runner blades are the heart of any turbine. These are the centers where the fluid strikes and the tangential force of the impact causes the shaft of the turbine to rotate, producing torque. Close attention in design of blade angles at inlet and outlet is necessary, as these are major parameters affecting power production. Draft tube: The draft tube is a conduit that connects the runner exit to the tail race where the water is discharged from the turbine. Its primary function is to reduce the velocity of discharged water to minimize the loss of kinetic energy at the outlet. This permits the turbine to be set above the tail water without appreciable drop of available head. The Francis turbine is a type of reaction turbine, a category of turbine in which the working fluid comes to the turbine under immense pressure and the energy is extracted by the turbine blades from the working fluid. A part of the energy is given up by the fluid because of pressure changes occurring in the blades of the turbine, quantified by the expression of degree of reaction, while the remaining part of the energy is extracted by the volute casing of the turbine. At the exit, water acts on the spinning cup-shaped runner features, leaving at low velocity and low swirl with very little kinetic or potential energy left. The turbine's exit tube is shaped to help decelerate the water flow and recover the pressure. The loss of kinetic energy per unit mass becomes Vf22/2. Degree of reaction can be defined as the ratio of pressure energy change in the blades to total energy change of the fluid. This means that it is a ratio indicating the fraction of total change in fluid pressure energy occurring in the blades of the turbine. The rest of the changes occur in the stator blades of the turbines and the volute casing as it has a varying cross-sectional area. For example, if the degree of reaction is given to be 50%, that means that half of the total energy change of the fluid is taking place in the rotor blades and the other half is occurring in the stator blades. If the degree of reaction is zero it means that the energy changes due to the rotor blades is zero, leading to a different turbine design called the Pelton Turbine. 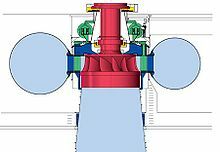 Francis turbines may be designed for a wide range of heads and flows. This, along with their high efficiency, has made them the most widely used turbine in the world. Francis type units cover a head range from 40 to 600 m (130 to 2,000 ft), and their connected generator output power varies from just a few kilowatts up to 800 MW. Large Francis turbines are individually designed for each site to operate with the given water supply and water head at the highest possible efficiency, typically over 90%. In contrast to the Pelton turbine, the Francis turbine operates at its best completely filled with water at all times. 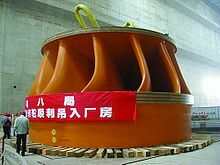 The turbine and the outlet channel may be placed lower than the lake or sea level outside, reducing the tendency for cavitation. In addition to electrical production, they may also be used for pumped storage, where a reservoir is filled by the turbine (acting as a pump) driven by the generator acting as a large electrical motor during periods of low power demand, and then reversed and used to generate power during peak demand. These pump storage reservoirs act as large energy storage sources to store "excess" electrical energy in the form of water in elevated reservoirs. This is one of a few methods that allow temporary excess electrical capacity to be stored for later utilization. Wikimedia Commons has media related to Francis turbine. ^ Bansal, RK (2010). A textbook of fluid mechanics and hydraulic machines (Revised ninth ed.). India: Laxmi publications. pp. 880–883. This page was last edited on 16 April 2019, at 16:06 (UTC).